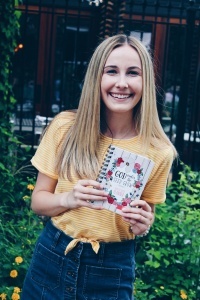 Meet Ashley Steiner, a junior at Samford University in Birmingham by way of Overland Park, Kansas, Fayetteville, Arkansas and Milton, Georgia. Steiner is a business major and actively puts her college studies to practice when running her own company, Ashley Ink & Paperie. 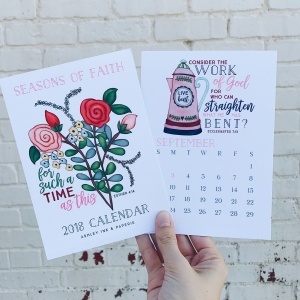 Ashley Ink & Paperie prides itself with its faith based roots and offers a variety of products including: note cards, prints, custom stationery, invitations, calendars, and planners with handmade illustrations. When Ashley isn’t drawing or making , Ashley can be found sitting in a local coffee shop and engaging her local community. I asked Ashley a few questions about what it’s like running her own company while also balancing being a full time student. 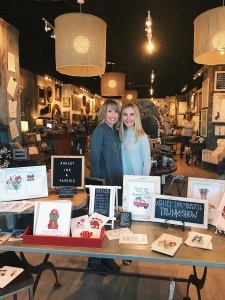 Ashley Ink & Paperie’s mission statement is rooted in Psalm 138:3, “He made me bold by strengthening my soul.” I had the chance to ask Ashley some questions about her experience running her own company and being a full time college student. how did you initially get into it? I started Ashley Ink & Paperie in 2013 right before my junior year of high school. I have had a passion for drawing ever since I was a little girl. I could always be found making greeting cards for friends and family, but I never knew this hobby could turn into a business! During my sophomore year of high school, one of my classes assigned an independent study project. My mom gave me the idea for the project to research how to create my drawings into notecards and prints instead of giving away the original copies. My research evolved into how to start a business and it became something I really wanted to do! In August 2013 before my junior year of high school, I officially launched Ashley Ink, which grew into Ashley Ink & Paperie in 2016. In October 2013 I sold my first wholesale order to a retail store, and in November 2013 I opened the Etsy shop. Growing up, I always made greeting cards to give family for holidays and special occasions. My friends started noticing and wanting cards too, so I decided to make copies instead of giving away the originals! I believe there is so much power behind the simplicity of a handwritten note. In a world so driven by technology today, sending a tangible message is even more important. As my company has grown, notecards and stationery are just a portion of the products. Prints, calendars, and planners are also popular among customers. Have you ever considered making other products, say (for example) t-shirts, posters, phone cases, etc. Is there anything else to Ashley Ink & Paperie besides your products? Ashley Ink & Paperie has a blog at ashleyinkandpaperie.com. Besides selling online, the company wholesales to stores in various states around the country and participates in local markets. I have presented my company in a few business competitions with Entrepreneur Organization’s Global Student Entrepreneur Awards, and Region’s New Venture Challenge. I was so surprised and blessed to have won both competitions last year! My company also sponsors Samford Zeta Tau Alpha by creating promotional materials for chapter events and philanthropy. How do you balance managing your company and being a full time student? Balancing life, school, and a business is honestly a lot like organized chaos sometimes, but I wouldn’t change it for anything! Holidays, summer, in between classes, and weekends are the major times I work on Ashley Ink & Paperie. Being a business major has been such a blessing (even though it’s hard!!) because the business school has been an incredible support for my company. I’ve been given incredible opportunities such as competing in business competitions and having an overflow of resources to learn and grow as a business owner. I’m a member of the Incubator Program for startup companies – which means I have access to mentors and an office space in the business building. I’m trying to come up with some good answer on how it all works together, but honestly, I know it’s not my own doing! There’s no other way to explain it – the Lord has been so faithful in leading me through this busy season of juggling school with owning a company. How have you seen your company and/or products change since being a student? Has it even changed? My goal as an artist and business owner is to never stop improving my artistic style. Since I have been at Samford, I have found so much inspiration that has greatly evolved my product lines. I have also traveled to lots of different places throughout college, all of which have inspired new work and products! My business classes have definitely helped improve the business side of operating my company and have sparked ideas for growth. What’s the most rewarding aspect of being the single mind behind your business? There are lots of rewards at the end of the day that stretch far beyond any challenge I face as a business owner. However, I must admit that I am not the only mind behind my company. I’m an entrepreneur and artist at heart, but there’s no way I could do it all alone! My friends and family-specifically my mom who works with me-are my biggest helpers and supporters. There’s nothing quite like meeting a customer for the first time and watching them find joy in something as simple as a notecard. It’s a feeling I cannot describe, but it gives so much reassurance in what I’m doing! I find so much joy in someone recognizing my notecards in O’Henrys or picking up a calendar from the Samford Bookstore. It’s the little things! My company is the channel through which I’m able to use the gifts I’ve been given in a tangible form, so I love waking up and being able to do that everyday! How do you engage the community with your designs? Social media is the major platform and means for communication with customers. Instagram by far has the most engagement, and it has been a fun way to connect with customers! I love creating local-themed artwork as well. It connects with customers on a home team level, and some of these local products are the most popular! Getting out and meeting customers the good ole-fashioned way through markets is also a fun way to engage the community. Has there ever been a moment when you’ve considered discontinuing your business? Oh, definitely. There are always unforeseen bends in the road and times that I’ve wondered if all the work is worth it…but then I remember why I started my company. Its purpose is so much greater than any story I can tell myself, and its calling comes from gifts and passion the Lord has placed in my life. In challenging moments, I’m reminded that I can’t rely on my own strength to succeed. What a relief! It makes me think about one day last summer when I had a booth at a local art festival. I was so excited to be there, but the weather had other plans. A massive gust of wind and pop-up downpour carried my booth’s tent down the street! Yikes. Oh well. I learned that it’s okay for business things to not always work out the way I expect–sometimes you win, and sometimes you get wet! Through every hard time, the things I have learned in the end help shape me and my company even more. What do you hope to see for the future of your company some day? I am so excited for the future of my company! There are lots of fun things in the works as it evolves into a lifestyle company. More to come on all of that soon!